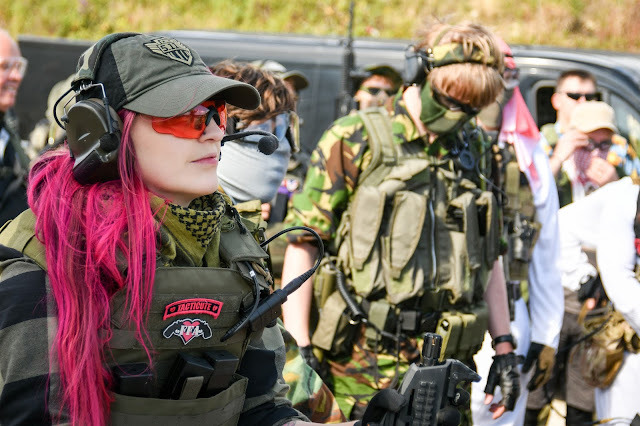 FEMME FATALE AIRSOFT'S FAVOURITE UK SITES 2018! Welcome back to the blog! Today I have another ‘Favourites’ post for you and this time we’re looking at my favourite UK Airsoft Sites of 2018! This post causes outrage every year, so let me clarify something straight off the bat - these are MY personal favourite sites (yours probably will be different) that I have played in 2018 - meaning I have not played every site in the UK and nor am I proclaiming that they are the best sites in the country, but simply saying that these are the ones I have most enjoyed playing. In 2018, I spent a lot of time out of the country at shows and events so I have played ‘away’ less in 2018 than I would have liked to but I still played a good chunk of the UK. With that cleared up, let’s get into my favourite sites of 2018! Strikeforce CQB is a 52,000 sq ft warehouse space in the centre of Gloucester that has been transformed into one of the UK's biggest purpose-built CQB sites, with a U.S kill house style layout it is full of wooden/tarpaulin structures - corridors, covers, kill houses and a toilet block at the very back of the site perfect for all those grenade kills. The site is split into two by steel columns and each side is completely different from the other opening up the gameplay options. The games Strikeforce put together use their site to the full extent that includes objective games such as capture the flag and VIP games. The pushback game is easily my favourite game that is run - both teams take it in turns to attack and defend both sides of the site and whoever clears the whole site of hostiles in the fastest time wins! The Facilities at Strikeforce CQB are good. My only complaint regarding the site is that they have introduced full auto burst fire in recent months which in my honest opinion is a little unnecessary but some players love getting their full auto play in. The Proving Grounds is a large woodland site in Selby, Yorkshire that keeps me coming back for more. It features a number of structures centred around a large bridge structure in a dense fern forest. What I love about Proving Grounds, is that unlike a lot of woodland sites players have structures etc to fight over rather than just fighting for ground and trees. The facilities on site include a covered safe zone that has room for almost 300 players, a food counter that serves hot food and snacks all day and a couple of portaloos (which is the only thing I dislike about the Proving Grounds). Although I mostly play CQB it is always really fun to crawl through the brush and through trenches for a day. Woodland does require an entirely different skill set to CQB making it a challenging day for players like me especially when snipers are king. The Proving Ground runs once a month, so be sure to keep an eye on their Facebook page for the next game day released! A site that is no longer in operation but does deserve a mention for my favourite sites for 2018! The Mall was exactly as it says on the tin - an old shopping centre in the heart of Reading city centre. Players could fight through all the old shops including a children’s soft play area, the loading bays and promenade. They had special game modes including NPCs such as the Juggernaut with the Microgun. Over the last 2-3 years, I’ve played the Mall on a few occasions and I’ve always really enjoyed my day, from running up the abandoned escalators and creeping through the dark corridors behind the storefronts it’s always been an intense and action filled day! News on the street is that Zed Adventures are on the lookout for a new CQB site to open in the near future! Before I get into this site, I have to declare that I do Marshall for West Midlands Airsoft and take the photos for their woodland site. Next up is the FOB. It was once a Home Guard Training Area during the Second World War and is a vast site covering 120 acres of varied woodland terrain. The site boasts some purpose-built structures and natural games zones from open dense woodland to 7 purpose-built, themed gaming areas such as “The Fort”, “Village” and the Crash Site which has an old beat up helicopter dominating the game zone. The game modes differ from game day to game day but there are often long objective based game modes and shorter attack and defend games which I am a fan of. The site has a bunch of cool props that add another element to the gameplay. MOD Swynnerton isn’t technically an airsoft site but, I have played airsoft on this MOD base a fair few times now so it’s going on the list for 2018. It was once a Royal Ordinance Factory that is now used for Army training and events. The training area has a full road system, buildings to fight through and even old vehicles to use as cover. The site allows the use of some really spicy pyrotechnics which adds to the feel of the game. The next game at Swynnerton is Operation Breakpoint ran by West Midlands Airsoft. MSW: FLASHPOINT ASTANA! A HIPPIE TALE! MY FAVOURITE AIRSOFT EXPERIENCES OF 2018!